Well, I fell off the #reverb10 train and I can’t get back on. Life has been busy and stressful the last week and I haven’t had time to sit down and focus on the prompts and write. I may try to catch up next week when I’m off work, but it is also the week before Christmas and we’re having both of our families at our house again this year, so I’ll be pretty busy getting ready. 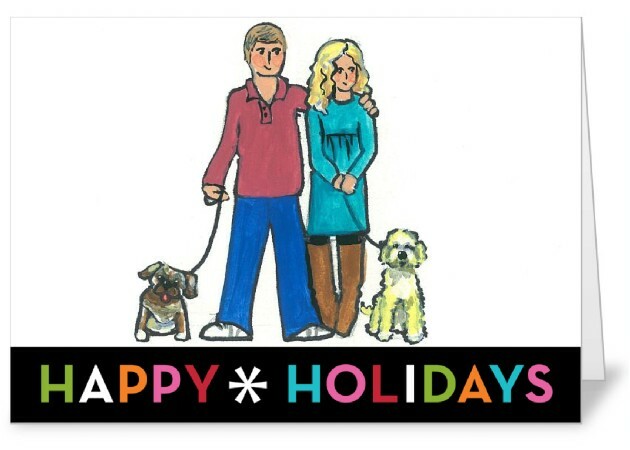 Anyway, I wrote about using Shutterfly for our Christmas cards and wanted to share the final product. If you didn’t get one, please don’t be sad. I have a couple extra and if you email me (amyc83 at gmail dot com) your address I’ll get one out to you. I didn’t want to do the usual family picture this year partly because it is always a hassle and partly because I’ve been feeling kind of unattractive lately. Not fishing for compliments here, just telling it like it is. 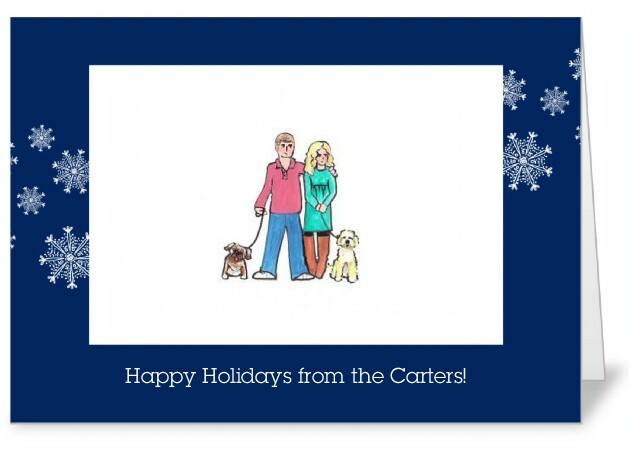 I asked my mother-in-law to draw a picture of us and our pups so we could use it on the cards. She’s an amazing artist and I’ll blog more about her work at some point. She scanned the picture and emailed it to me and I got to work on the card. It was hard to choose the right design because the colors in the picture weren’t the same as the colors in most of the cards. For example, my husband’s shirt in the picture is red-ish, but not the same red that Shutterfly has in their designs. If I picked a card with a red border and put the drawing in it, it looked off. Same with the green. The only color that worked was blue, so I chose a design that was blue with white snowflakes. It wasn’t my favorite design, but I went with it anyway. Another problem was that the picture file was really small. The resolution wasn’t great because it had been scanned at home, but when I plugged it into the card and re-sized it to fit, there was no low res warning so I assumed it would be fine – if the image is too low res, there is a warning that pops up to let you know. I ordered the cards and was so excited that I had gotten all 50 for free. All I had to pay was $8 shipping and saving money is probably my favorite thing – besides spending it. The cards arrived on my doorstep a few days later and I was so excited to open them and send them out. Cue wop wop noise. They were very disappointing. The drawing was tiny and blurry. The matte finish I selected didn’t look right. The card design was boring and not Christmas-y enough (I always pick cards that say “Happy Holidays” because we send them to some people who don’t celebrate Christmas and I try to respect that, but I want the cards to look like Christmas cards, not something else). This is what the card looked like on the computer. I didn’t take a picture of it once I had them home, sorry. Maybe I was crazy for hating it, but I did. So, I contacted Shutterfly and explained my situation and they were awesome. They gave me a code for 50 more free cards and I didn’t even have to send back the crappy ones. I got the original drawing from my mother-in-law, took it to a Staples Copy and Print store a block away from my house, got a high res scan, and they emailed it straight to me. Then, I decided to play with the colors a bit so I could choose a different design. I made the colors darker and more saturated which helped with the whole red-ish issue. I uploaded my new pic, found a design I loved that didn’t clash with the colors in the drawing, and ordered my new cards! I did have to pay for shipping again, but I really didn’t mind. I was thankful they were willing to give me the credit since I got the cards for free in the first place and shouldn’t have been complaining. Way better, right? Or am I just a crazy person as usual? Wait, don’t answer that. I love your cards! Your MIL is so talented! I just sent your card out today, so hopefully you'll have by this weekend. I saw the card at my parents' house today and it was super cute! why is that guy wearing a pink shirt? mike is taller than you in the card. jsyk.